On the right is the VERA+ prototype presented at the NEC Motor Show in 1982, in the UK. The main objective for Peugeot engineers was to obtain a drag coefficient as low as possible. Even if the prototype differs from the Peugeot 309, it doesn’t differ that much. General shape is identical as well as all doors. Note that the prototype features a Peugeot badge, not a Talbot one. From top to bottom you can see some drawings and pictures of the C28 study in its very beginning. General shape resembles the one of the VERA+ prototype. We can note that the first drawing, which is actually the fifth study, is very close to the car launched on the market. The second drawing, which is the sixth study, is even closer to the 309 we know. The first picture shows a real-size model. If the front of the car is more or less frozen (apart from the grille), the rear part is still of great concern. The second picture shows the front part of the car as we know it. At the back we can see a real-size model which is actually the 309 as Peugeot launched it. The dashboard as shown is greatly inspired from other Peugeot cars and steering wheel is the one of the Peugeot 305, and was also fitted in the late Talbot Solara series. The dashboard will be slightly different in its final version. Passenger side will be reworked and the identation will be placed higher in order to place a real glovebox. All edges will be rounded to improve safety. 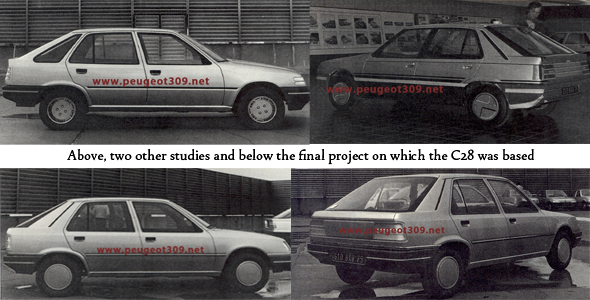 Shortly after the launch of the Peugeot 309, Peugeot studies an estate version. The task is entirely left to Heuliez, a French company which works as a production and design unit for car manufacturers. The prototype was originally intended to be presented at the Paris motor show in 1986 but Peugeot was quite hesitating about the version. Heuliez did present the car in 1988 at the Geneva motor show. The prototype showed a two-in-one car: the right side showed a 5 door model and the left side a 3 door model. At the same time Peugeot had been conducted some markets surveys to see if the production of an estate version would be profitable. If results were successful, Peugeot thought it was too late to produce such a version, the 306 being already studied to replace the 309. Peugeot didn’t make the mistake twice and the Peugeot 306 had an estate version. Gruau is a French bodywork company specialized in industria coachbuilding and also made some studies. The first one was made as soon as 1986. Gruau had heard critics about the boot sill being too high, which was inconvenient to load heavy items. It then decided to offer 309 buyers a modification consisting of lowering the boot sill by attaching the part between tail lights directly to the tailgate. The modification thus made easier the loading of heavy objects and responded to a real demand to which Peugeot finally responded in 1989 with the Peugeot 309 mark 2 and its low boot sill. During the same period, Gruau also realized a design study about a convertible version. The project was completed in 1987 and was greatly inspired by the Peugeot 205 Cabriolet, designed by Pininfarina. The Peugeot 309 convertible integrated a central bar providing additional stiffness and the hood was visible in folded position. Peugeot didn’t seem very interested in the project but when Renault launched a covertible version of the Renault 19, they did notice that the car sold well and they finally decided to produce a convertible version of the Peugeot 306. The Peugeot 309 Break “Modul R” was presented at the Tuning Motor Show in Paris in 1987 by French company Etud Integral. The car is actually a 309 which tailgate has been removed to replace it by another one making the roofline to follow the full. The car becomes an estate without much modification.